Stood alone in this class but what a super start to the day, absolutely gorgeous sable boy of lovely size, very elegant both standing and on the move. I loved his head and eye shape, topped by excellent ear carriage giving him a wonderful expression. What a superb shoulder he boasts giving him a glorious length and arch of neck, moved exceptionally well for one so young. BEST PUPPY. Just as I was recovering from my gorgeous puppy winner I was faced with a stunning junior! filled the ring with his presence. Such a happy chap and none stop extrovert. Lovely chin and finish to his muzzle, bright intelligent expression. Elegantly constructed, floated around the ring with a style and elegance which belied his young age. Little to separate these two very lovely young men. BEST OF BREED and well done. 2) B. 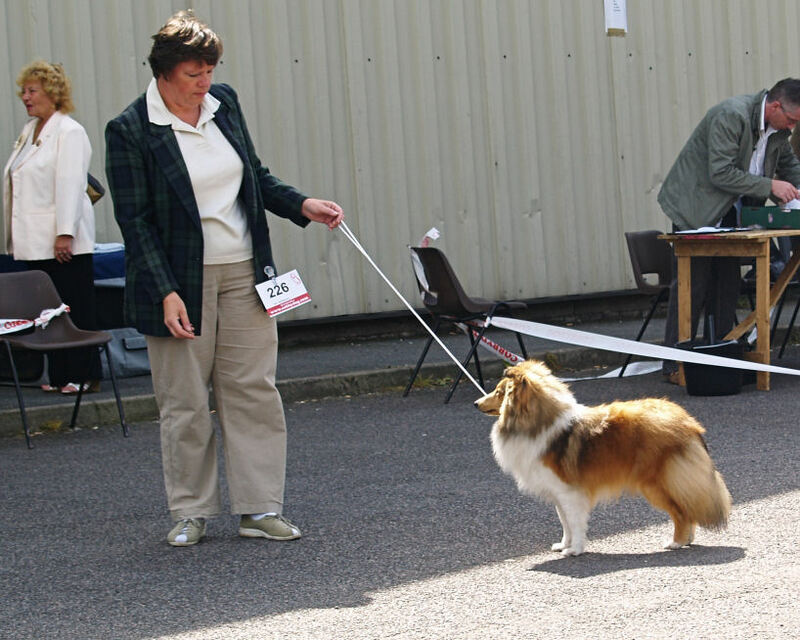 THE BANDLEADER WITH M.
Pale golden sable dog, another who is still very young and needing more time to develop than my previous class winners. Fair construction and moved freely. 1) Parkers CHERYLDENE ALEXANDER AT DAZZLEROCK. At first site I knew this boy had to be my class winner, another in possession of that WOW factor! Rich shaded red coat sparkled and shone in the sunshine. Glorious head pattern. Well chiselled through the cheeks with a super finish to his muzzle and underjaw. Lovely dark eyes gave him a most seductive expression. I loved his hind angulation although he is just a touch narrow in front. Moved very well in profile. Pushed hard for BOB. .i could have taken her home in my pocket! 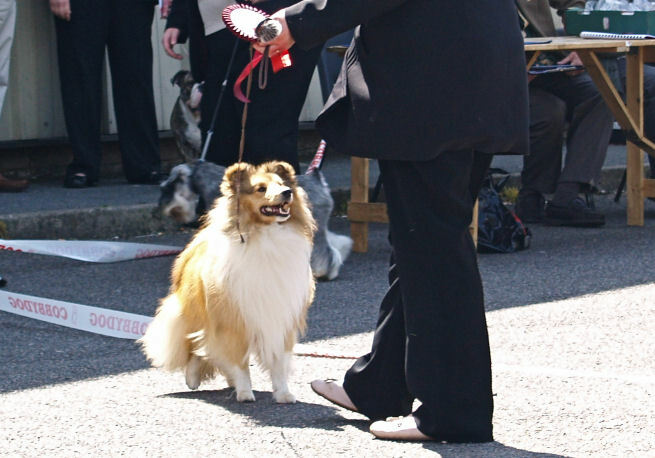 3) Sorockys FRANCEHILL ONLY ME Sh CM completed a super trio of quality shelties.